Hunting rabbits, or any other animal for that matter, is also about being humane, as much as you can. Some think it’s cruel, some think that you can still do it in a humane way, so let’s go into the details. 0.1 Can hunting be humane in any way? 0.2 Is rabbit hunting necessary? 0.3 Can rabbit hunting be humane? 0.4 Is rabbit hunting for control necessary nowadays? 1 How to find rabbits anyway? 2 How to judge a rabbit hole? 3 How to hunt rabbits? Can hunting be humane in any way? Humane relates to sympathy, mercy and kindness. According to many, there’s no way to kill an animal in a kind way- a kill is still a kill. We need to point out that humanly killing your game means to do it with as little pain as you can. How can you kill in a humane way? How can we tell when a method isn’t as painful as others? These are only few questions to think about before you go out and kill your game, no matter your game is. Many say that a sport that doesn’t serve to anyone else is quite cruel. Fox hunting with hounds is the perfect example as it was done only for the pleasure. That’s not the case with rabbit hunting as it’s quite important to animal owners, farmers and land owners as well. If you didn’t know it by now, rabbits are seen as pests in many places around the world (Europe is just one of them). They’re able to damage fences, trees and plants, leaving holes behind them. Their damage leaves also a hole in your wallet, whether it’s for the pricey veg they ruin or the holes you need to cover. Truth be told, the rabbit meat is very tasteful and doesn’t get the popularity it deserves. If you’re reading this, it’s clear that eating meat is no problem for you and you should try rabbit meat some time. Can rabbit hunting be humane? There are many methods to kill rabbit or to control them and the methods are different when it comes to cruelty level. For instance, using a snare to trap the rabbit is less humane than using a high powered rifle. 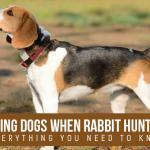 The more you know about the methods you can use for rabbit hunting, the easier is going to be for you to decide which suits your skills and principles a lot better. Nevertheless, try several ways until you find out which suits you the best. Is rabbit hunting for control necessary nowadays? You can find plenty of rabbit repellents that are going to keep them at bay. The repellents are made with bright lights and powerful smells, so they’re pretty effective. You may also try the anti-rabbit fencing in order to block their access to your land right from the beginning. However, these methods aren’t 100% effective and they’re not the best solution for the large farms or lands. When rabbits can’t get to a farm (due to the repellents), they’re simply going to move on to the next one. The rabbit repellents may work for a small garden, but they’re not going to be of much use for a big farmer. Forget about building a fence around your land- it’s a big waste of time! How to find rabbits anyway? In order to kill your game, you’re going to have to start with finding it. Finding rabbits isn’t as challenging as you’d think. There’s plenty of them in the grassy areas, for sure. However, finding them per se is going to require you some skills. One thing that rabbits really don’t like is getting wet. They love the dry ground just as much as they love the soft ground which is easy to dig in. Therefore, you’re always go to find rabbits in the trees around the edges and almost never in the middle of a field. Mud mounds or tops of ditches, higher grounds aren’t very popular among rabbits. Don’t lose hope around lakes or rivers as rabbits may dig holes near the big volumes of water. However, they’re not going to dig in the ground around them. Rabbits do love their grass of planted crops and they’re going to travel a lot in order to get to it. They’re willing to go in the middle of the night, crossing fields or roads when they know that a plenty of green is at the end of their trip. It’s no surprise to find holes away from a cornfield. Their constant need for food makes them really easy to found in the countryside. Find a field, follow the thick tree line or look for some blackberry bushes. Seek the damaged areas- once you found them, you’re only few steps away from killing your game. Rabbits like a lot the wooded areas and they also know that not many animals like crawling into hawthorn trees. This is why you may end up with some scars while trying to find them. The real challenge is to find the rabbits above ground and not their holes in the ground. You need to get up really early in the morning. Better yet, go out there as soon as it starts to get dark. Get your lamp too, of course. You should go in a place where you know there are rabbits and be really sneaky when doing it. You shouldn’t have a natural smell and you should definitely camouflage yourself as much as you can. Move slowly and don’t make a sound. Rabbits do leave various calling signs. A chew mark on a tree, some droppings on hard ground are great signs that help you while hunting. Check the “rabbit runs” as well. We’re talking about the path that is highly used and the grass is pressed down and even turned into a tunnel like shape. How to judge a rabbit hole? 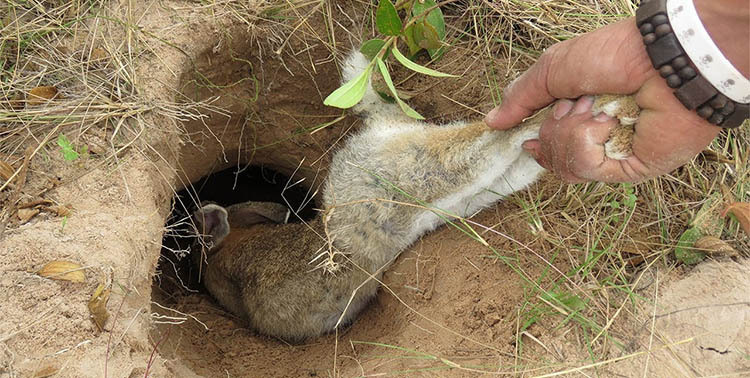 Rabbits have been surviving in holes for quite some time now and they master it. They’re aware that if they dig it at a step angle, it’s going to be more difficult to run in/out. On the other hand, digging the hole in the middle of some brambles is a safer for them. A flat and lever path in the hole is known as a “bolt hole” and helps them run in and out really fast. Bolt holes are smaller than the regular ones and finding them is really tricky. Sometimes a barrow be placed under a fence, but it’s not going serve as a bolt hole. Is there any loose oil on the ground? This is pretty much common sense and loose and fresh soil means that the rabbits have been called out. Inspecting the hole very careful is going to help you know for how long the hole was dug. The amount of soil is also going to inform you about the depth of it. Plenty of twigs and dead leaves in the barrow mean that there is no rabbit using it at the moment. Take a look at the grass/foliage around the outside of the entrance. When it doesn’t look like it has been pressed back out/into the hole and it’s growing over, the barrow is dead for sure. On the contrary, if the leaves look like they’ve been kicked clear, some rabbits are most definitely use it at the moment. When the overhanging foliage looks like it has been pushed at the entrance/exit, chances are the hole is used for sure. You need to be 100% sure that it’s a rabbit hole. If it’s a large hole, it may belong to a badger and not to rabbits. Rabbits cannot dig squares and they almost never dig down onto tunnels (which is something that ferreters do). Don’t forget to take a look at the whole picture. Rabbit droppings, chewed bark, tracks are all letting you know that you’re close to your game. Keeping in mind the tips is going to help you know for sure if you’re dealing with a big or small pest problem. If you’re going to rabbit hunt for extermination, the methods to use are various and many. Taking a closer look at some of the ways is going to help you which works the best for you. The more you know about a method, the easier is going to be for you to decide. Nevertheless, actually trying them may be the most conclusive way for anyone out there. Even though this method is very efficient, fast and cheap, it’s not as popular as it should be. Pits, various forms of cages and boxes are typically used in trapping. It’s a really cheap method. It’s even cheaper when you’re building your very own traps. You’re only going to trap one rabbit at a time. It’s a bit time consuming as you’re going to have to check the traps over and over again. You also need to bait them until you’re done with all the rabbits. You cannot rely solely on trapping if you’re dealing with a large scale extermination. It’s helpful, but it’s not enough. You may have success with trapping only during the summer months when there’s plenty of food for the pests. Budget-friendly, simple and easy to do, trapping is a solid option for the small areas or when you’re into getting a nice game stew for dinner. 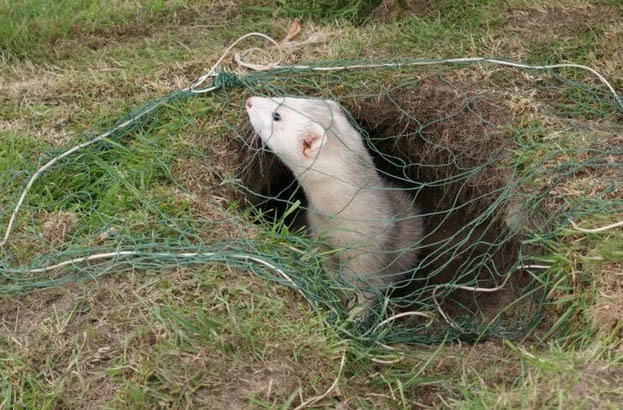 In the case of ferreting, you’re going to use ferrets or polecats for flushing the rabbits out of their holes. Typically, you’re going to get them into nets installed around the holes. 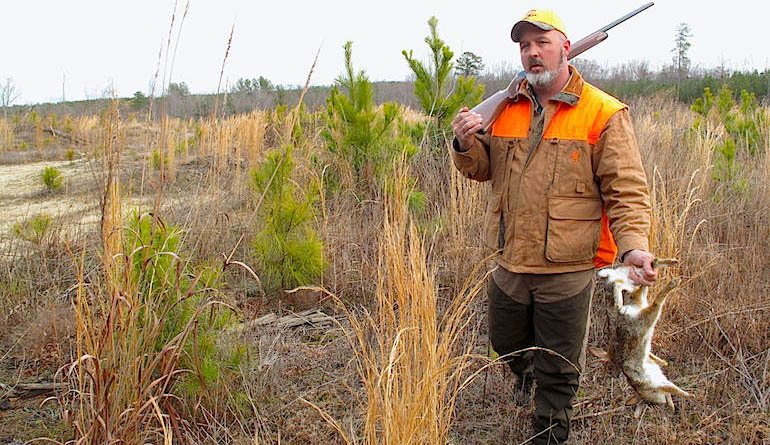 You may use long nets, dogs and even shotgun together with this method. This method is quite time consuming, especially if you have many holes. You also need more people for covering the holes. If there are holes on both sides of hedgerow, you’re definitely going to need two people. You do need ferrets in order to try ferreting. Unless you’re going to hunt miles of land or even hunt other places, you shouldn’t try keeping ferrets as it’s an important commitment. Otherwise, you’re also going to have to find/pay ferreters to solve the rabbit’s problem for you instead. This is no easy way to hunt rabbits. Not only do you need to be in good shape, but you also need time to practice it until you truly master it. Ferreting is truly a highly efficient way to reduce the pest population, but it’s also not very accessible to most out there. You should ask other land owners about ferreters as it may be helpful for your efficiency. 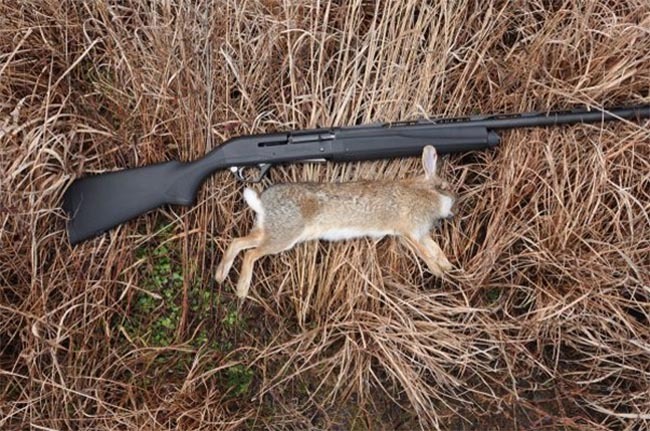 Most farmers out there do own a shotgun, so it only makes sense that they’d use it for killing rabbits too. Efficient and fairly easy, shooting comes with its ups and downs too. You can combine shooting with other hunting methods. It works with ferrets and dogs as well. Taking rabbits under control is a good reason for you to use your gun for stalking, lamping or flushing. Even though shooting shouldn’t be used as a single way to eliminate the pests issue, you may still try it as an additional method to exterminate the pests. This method for hunting rabbits is truly under rated, even though it’s quite efficient. 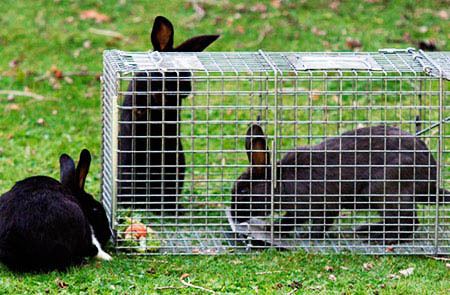 You need to use wire based traps to snare the rabbits so it’s not as complicated as you may think. You may use the wire loop for getting rid of many of the pests on your land. Even though it’s not for anyone as it does take some practice for getting it right, snaring is highly efficient and you should at least try it at times. The chances for losing the snares are quite high. They may also get stolen so that’s a risk you need to take. 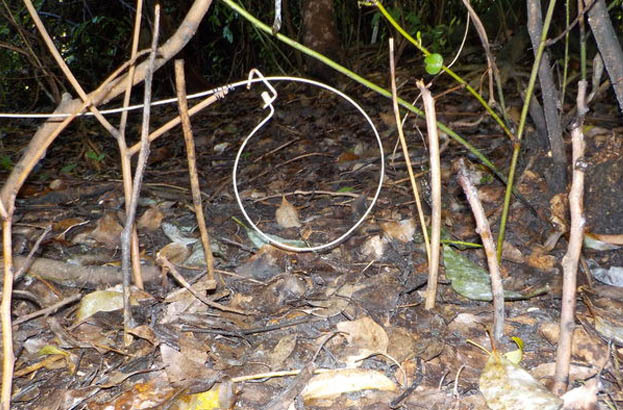 Snares aren’t seen as humane. The animal may strangle itself or even pull off some parts of its skin or fur. Long netting is pretty self-explanatory: you use long net to catch your rabbits. You should use this method at night, placing the net between the holes and the feeding places. You’re going to chase the pests into the net, which is very effective. You can kill a high number of rabbits in no time. It’s going to take more than one hunter to cover a larger land. You should split the area into chasers and killers (two in the field and two on the net). The risk for rabbits to get away is quite high as they truly love this sport. Long nesting is an effective method to use when the land is loaded with rabbits and hedgerows. It’s useless to try using it on a small garden with only two rabbits. Effective and challenging, long netting addresses to the dedicated hunter and it’s becoming a dying art as we speak. Training dogs for rabbit hunting is a great way to be more effective, but also to bond with your dogs a lot better. Using dogs for rabbit hunting is going to make you even more successful. You may use them as receivers, gundogs or trackers, but there are ups and downs for each situation. Dogs are better at hunting than humans. They’re fundamental when it comes to scent trailing or flushing. Training your dogs doesn’t come cheap so it adds up to your spending. Is your wallet thick enough? Yet another less popular hunting method, falconry is about using birds of prey for hunting. Falconry is truly for anyone willing to spend time with the bird of prey and it’s a long road to take. 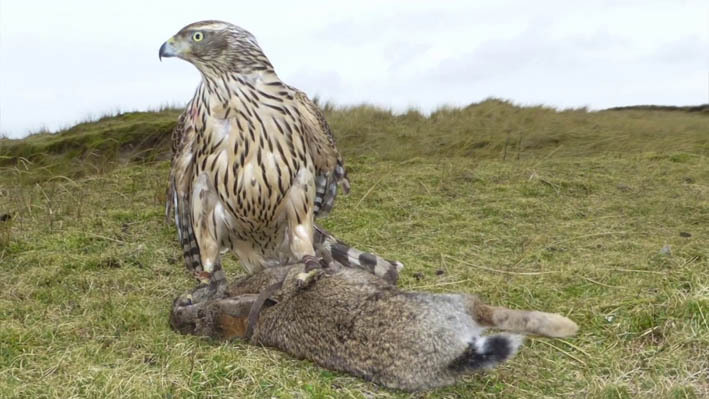 Falconry is a long time thing and it’s more about the sport, and not so much about putting the rabbit number under control. It’s a lot easier to try it when you know a falconer that wants to land some game. It’s one astonishing sight to see. You should definitely watch it if not try it for yourself! If you’re determined to use it for pest control, you shouldn’t do it in the first place. Falconry is about training a bird for hunting and not so much about controlling pests on a land. There are many ways to hunt rabbits, and you should go with the ones that fit your needs and skills the best way. Try each of them and find out which works the best for you and your land. The more you know about a method, the easier is going to be when you’re out there, trying your best to get rid of the pests.